The electric toothbrush is constructed of a first portion and a second portion. The first portion is able to pivot with respect to the second portion via a hinge. The first portion houses componentry associated with the toothbrush. 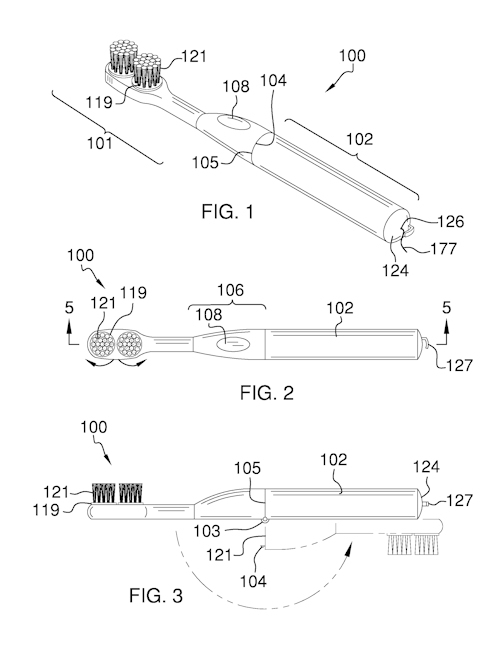 The second portion includes a floss dispenser on a distal end, and is used as a handle for the electric toothbrush. The first portion includes at least one rotating head that includes bristles adapted to brush teeth. The at least one rotating head is in mechanical connection with a bevel gear. The bevel gear is in mechanical connection with a motor via a drive shaft. The motor is in wired connection with a switch and at least one battery.